The Wildwood Travel Trailer is a great, lightweight travel trailer with a rear bunkhouse and outside kitchen. The outdoor kitchen has a sink and extra fridge for your drink, as well as a large countertop and cabinets for storing and prepping pantry items & supplies. Inside, the rear bunkhouse has 3 bunk beds that are large enough for adults, but also can be used as a retreat area for the kids. This is a very simple, easy to use trailer and is a breeze to tow. The 28′ Wildwood Travel Trailer is our largest bunkhouse unit. 3 bunk beds in the back provide ample sleeping room. Equipped with an outdoor and indoor kitchen, this unit is made for a large group. 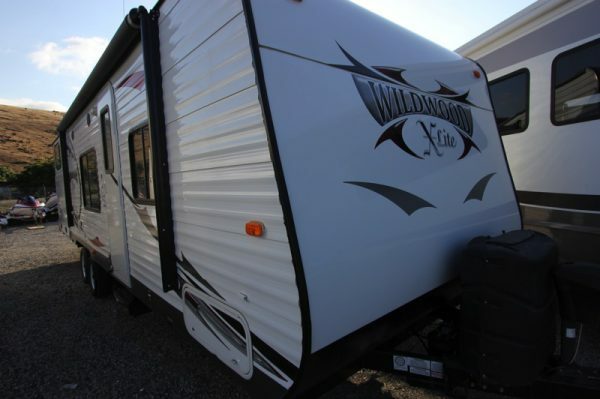 The Wildwood is loaded with every option available, Power Awning, Power Jacks, and Slide!